Watch Monsta X New MV on Youtube Now!! Monsta X (Hangul: 몬스타엑스; often stylized as MONSTA X) is a South Korean hip hop boy group formed by Starship Entertainment through the survival show "NO.MERCY" on Mnet in 2015. 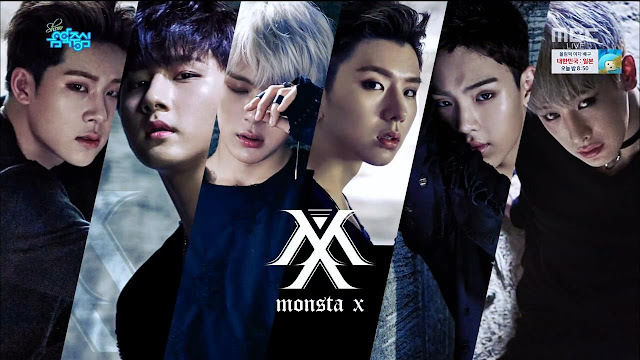 The group is composed of seven members: Shownu, Wonho, Hyungwon, Kihyun, Jooheon, Minhyuk, and I.M. The group was formed as the result of a TV program called No Mercy on Mnet, which began running on December 2014. A single released during No Mercy was "0 (Young)," on February 4, 2015 starring Giriboy, Mad Clown, and Jooyoung along with Jooheon, Kihyun, Wonho, Seokwon, and I.M. "Interstellar" was a single released on February 12, 2015 with Jooheon, Hyungwon, and I.M, featuring Yella Diamond. On April 28, Jooheon released his first mixtape, entitled JUNG JI, which included a collaboration with JustMusic Entertainment's BlackNut. On May 14, Monsta X's debut music video for "Trespass" was released. A reality web series titled Deokspatch, starring the 'NO.MERCY' trainees, was part of the promotional effort and ran for 2 seasons. The song "Rush" was released on September 1, 2015 followed by a music video for their second mini album, "Rush." At the 2015 Mnet Asian Music Awards, Monsta X performed their songs "Trespass" and "Hero" on the red carpet before receiving the "Next Generation Asian Artist" award. Monsta X attended KCON 2016 in Abu Dhabi, United Arab Emirates on March 25, and Chiba, Japan on April 9. They are also performed at part 2 of the KCON's Los Angeles event, on July 31. Monsta X's third mini album The Clan Part. 1 Lost was released on May 18 with the title track "All In". In August Monsta X joined label mate Cosmic Girls’s Exy, Cheng Xiao, SeolA, Soobin, Eunseo, Yeoreum, and Dayoung in creating Y-Teen, a project unit group that will promote KT’s phone fare service and release music together.